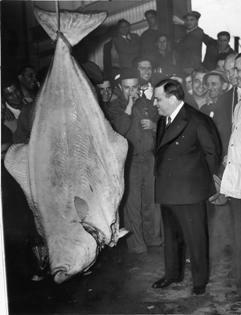 While it may have been fashionable for Fiorello H. LaGuardia (Mayor of New York) to pose with a dead halibut in 1939, it is questionable whether that portrait style works for a LinkedIn headshot. I bring this up as I’ve been working with the CEO of a small manufacturing company in the Midwest. His LinkedIn headshot shows him standing next to a trophy deer mounted on the wall. My initial reaction was to have him take a new photo. But in his part of the country and with his clientele, maybe that’s OK. If he was in Seattle (where I am), that headshot would not be a crowd pleaser. Why a good headshot is important. If you’ve spent any time on LinkedIn, you’ve seen some very interesting headshots. The good news is that LinkedIn has shrunk the size of the headshots so they don’t include as much background as before. And a lot of people have figured out that having a good headshot is helpful to their business and career. Why does it matter? Your headshot delivers your first impression and personal branding more than anything else on your profile. I know a lot of business people who look at a person’s LinkedIn profile before having a meeting or phone call with that person. I know that I do. Your headshot also helps you be recognizable when you meet someone at an event or for coffee at Starbucks. That’s one reason not to use a photo you took 10 years ago. Photo taken with your significant other. True story. I was sitting with the CEO and VP of a company getting ready to have a phone interview with a job candidate. Let’s call the candidate Fred. In the few minutes before the call, we were going over Fred’s LinkedIn profile page. Fred’s headshot showed him hugging a woman. The CEO said “is that his mother?” The VP said “I think that’s his wife.” And the two of them went back and forth with that conversation for the next 5 minutes until the call started. When we reconvened later that week to talk about the candidates we interviewed, I asked what they thought about Fred. The CEO said “was that the guy posing with his mother?” And the VP said “no, that was his wife.” That’s all they remembered from the phone interview. Fred never had a chance. The deer in headlights look. This is the “I really don’t want to have my photo taken” look. Eyes are as wide as saucers and teeth are bared in a forced smile. According to Peter Hurley, a highly respected portrait photographer, you want your headshot to display confidence and approachability. This usually requires relaxing in front of the camera, something which can be hard to do. A good photographer can help a person get the right look. Photo too light, too dark, or with a cluttered background. My recommendation is not to take your headshot with your cell phone and a selfie stick. Find someone with a good quality camera that understands lighting. It can be in natural light (not the bright mid-day sun) or with flashes/strobes. I find headshots of people taken at Disneyland, in a bar, skiing, at a wedding, etc. to be very distracting. Many professional photographers recommend using a pure white background. I think gray or black can work as well. Just make sure that the person is the center of attention, and not lost in the jumble of the scene. No photo at all. I’ve seen one statistic stating that having a professional LinkedIn photo makes your profile 14 times more likely to be viewed. Another statistic states that LinkedIn members who include a profile photo receive 21 times more profile views and up to 36 times more messages. Bottom Line: According to LinkedIn, they have over 500 million members. If you want to leverage LinkedIn to find a new job or grow your network, you should consider investing in a good headshot. Minus the dead animals.